Camels, muskrats, and bears - oh my! And that’s not all – this park’s fossil collection includes mastodons, sabertooth cats, otters, pronghorn, ground sloths, hyena-like dogs, and fish, frogs, snakes, and fowl! And, you may think a horse is just a horse, but not when it’s a single-toed Hagerman Horse. Animals that lived between 3 and 4 million years ago left their mark at Hagerman Fossil Beds – the Earth’s richest fossil deposits from the Pliocene Epoch, the last glimpse of time before the Ice Age. Back in 1929, after a local rancher discovered “bones” poking out of the desert, paleontologists from the Smithsonian Institution started digging here for fossils. 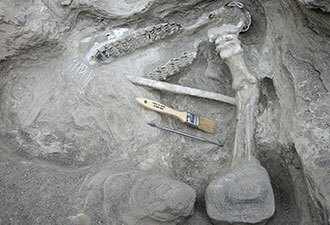 Those bones were the first chapter of a fossil story that is still being written. Discoveries continue, and a recent, thrilling find is the fossilized leg of a large cat called Homotherium. After looking around the area, raise your eyes to breathtaking views of 600-foot-high bluffs towering above the stately Snake River, which alone are worth the trip. Remember those who passed this way before by checking out the dusty remnants of the Oregon Trail – the park is one of four in the National Park System that contains parts of the Oregon National Historic Trail. Gaze upon and hike through fields ripe and abundant with melon gravels left behind by the Bonneville Flood 14,500 years ago. The wide open spaces are great for hiking – choose an easy trail or one of the tougher ones to suit your mood – just keep an eye peeled for rattlesnakes! 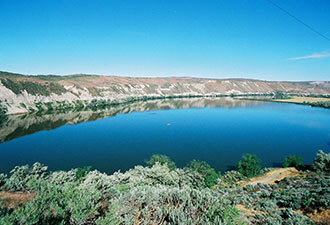 The Hagerman Valley is also a hot-spot for birdwatchers and anglers. Stop by the visitor center in downtown Hagerman and get up close and personal with a fossilized camel skull, a fossil turtle pieced together by paleontologists, fossil horses, and even a fossilized bear. Children (and some adults!) will enjoy the mock excavation pit, and nearly everyone loves to pick up and examine the fossil replicas, because hands-on is always a fun way to learn. Excellent photographs and descriptions of past and current fossil finds get you ready for your free, self-guided auto tour. If you’re lucky enough to have a boat, you can tour the park by water, but most people drive the 8 miles or so south of town and stop at the overlooks. Breathe in the clean high desert air, and if it has just rained, you’ll taste the sagebrush! 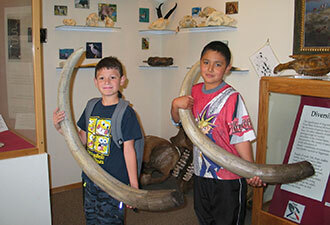 Visiting Hagerman Fossil Beds National Monument is always free. Plan your expedition and don’t forget to browse the bookstore and gift shop because proceeds help support park activities.